It’s big, it’s exciting, it’s fun. Everyone’s talking about the giant slide setup at Manta Park, a slide so tall it is intimidating even for adults. The slide-chute is long, and kids can’t wait to go down and through, then climb up and do it again. 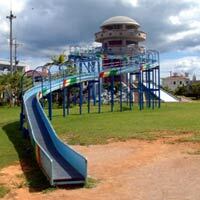 Manta Park is a children’s mecca, filled with swings, a skateboard zone, basketball hoops and of course, the slide-chute. Manta Park has plenty of greenery for shade, and flowers too. Adults like the observatory and the lounge areas where they can relax while the youngsters play. The park has restroom facilities, but no parking. To visit Manta Park, take Gate 2 Street straight through Takahara intersection to the second traffic light following, then turn left. As a hospital is viewed on the right, travel straight past the Awase Lawson to the second traffic light. Turn right and you’re at Manta Park.